Pointui Home is a new finger and touchscreen optimized user interface environment for Windows Mobile devices. It functions as a smartphone home screen/agenda center with many finger designed controls and widgets. It features both touch and d-pad controls and iPhone like scrolling capabilities proving one touch access to some of the most common phone and device functions. The current version of Pointui Home is being made available for free. It is compatible with Windows Mobile 5 & 6 Professional with Pocket PC 2003 support planned soon. Read on for a video demonstration of it in action. I thought this was a PALM site. I'll go to a Win-Mobile site for windows stuff. Palm sell Windows Mobile devices now. Decent ones, too, albeit unimaginative. You know, this does raise a good question. I've been around PIC since late '96, and there is, of course, a trend lately. Is this a Palm-the-company site, or is this a PalmOS site? The trend is with PALM, not PIC. As far as I can remember, PIC has been following PALM et al whereever the path leads it. There isn't a whole lot to report on Palm (Palm OS that is). I was pretty excited about getting a Centro when my contract is up. This morning a resident showed up with an HTC Mogul. What a sweet device. I had my T2. How humbling. Anybody else starting to get the feeling that walking around with a Palm Pilot is like having one of those WWII looking brick cell phones or or listening to old vinyl LPs and thinking the sound is good? Or maybe showing up in high-school gym class with dirty athletic socks that don't match? Like you have the IQ of a hammer? I felt that today for the first time. Keep it Palm related. If we want micro$oft news we can get it from every other site. If not then just open it up to everything like the Apple Touch/iPhone as well. Heck why not bring the guys from NewtonTalk.net over here as well. As said before, Palm has been selling Windows devices for two years now and it's almost a even split between Palm OS & WM in number of units sold of late. 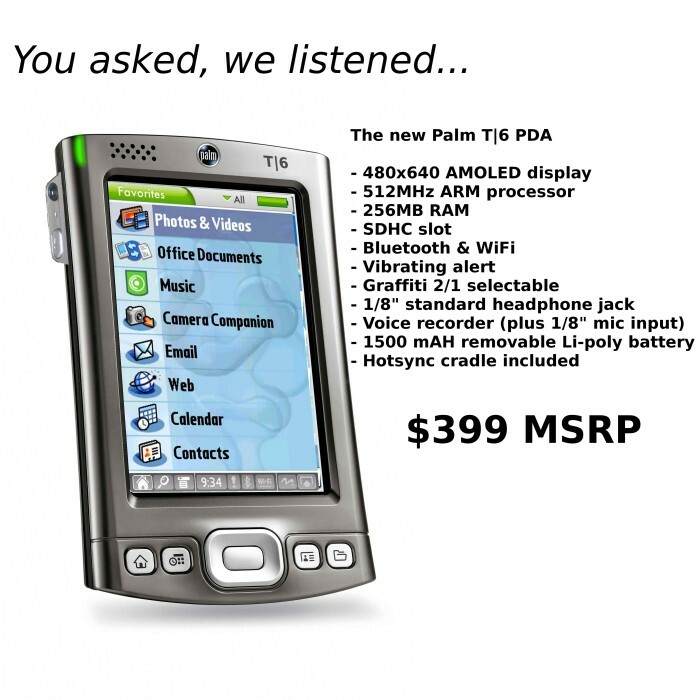 Anyway - I do try to keep the focus on Palm the company, which is why I do point out noteworthy windows mobile related things as they come up. However, the core focus will always be Palm OS given the much larger number of users, developers and readers out there. Other than pops, clicks, and skips, vinyl LPs DO sound good! Oh, but other than that, I agree with what you're saying. Like being lepers except that our Palms haven't fallen off. > larger number of users, developers and readers out there. Hmmm...that is to say, PIC will shortly cease to exist. Yeah, yesterday a guy at my bar was bashing the Treo 700. Said it is the worst decision that he ever made... I pulled out my TX to show him that it could access the wi-fi in there and could do everything I wanted it to do. Obviously they upgraded to 802.11g so I couldn't even find the network. I felt like I was stuck in the past. PalmOS != Palm. Is that too hard to figure out? "I had my T2. How humbling." I have a T3. I still turn heads. I watch DVDs and TV shows I've shrunk to fit on a 1GB SD card and they look pristine. I play all sorts of awesome-looking games (including Nintendo emulated classics, which is always a hit). I check my IMAP email account from anywhere via Bluetooth link to my cell phone. I listen to MP3 and OGG files (mostly podcasts, but some music too). I browse the internet via Opera Mini. In addition to the basic address book and calender features (love having it vibrate in my chest pocket to let me know of an appointment without some obnoxious alert). All this on a device over 4 years old, and still the fastest Palm ever made. Go figure. Still, I'd like an upgrade. Something with a better OS, built-in wifi, and no slider. And support for SDHC. Without ditching any features already present on the T3. Still, I'd like an upgrade. Something with a better OS, built-in wifi, and no slider. And support for SDHC. Without ditching any features already present on the T3. Whether you approach it either from the perspective of an upgraded T3 or an upgraded TX, it ends up looking like the same device. Come on Palm; make it already! If this ends up being true, Apple is one step closer to "perfection". Here's hoping that February brings a truly open SDK as well. "Whether you approach it either from the perspective of an upgraded T3 or an upgraded TX, it ends up looking like the same device. Come on Palm; make it already!" Much more realistically given Garnet's limitations, that thing should have a bright 320x480 TFT-LCD, a 416mhz CPU, and 128mb RAM in addition to an internal 1 or 2gb flash volume. I can live without the 1/8" mic input jack & standard cradle. Otherwise, that's a PERFECT concept device for TX/T3/T5 users looking to upgrade! However, the core focus will always be Palm OS given the much larger number of users, developers and readers out there. Whoa!!! How did this 6 year old sentence show up in this new thread? Must be a corruption in the database. :-| Hope it is an isoldated instance and doesn't cause sitewide problems. Carl Yankowski, who piloted Palm during the peak of the PDA boom, was tapped Wednesday to head Ambient Devices, a company that embeds wireless data into everyday products. The Ambient Umbrella glows when rain is in the forecast. Handy, but I imagine that the $125 gadget is lost as easily as any other rain deflector. Yankowski, who was also president of Sony Electronics and CEO of Reebok in the 1990s, replaces David L. Rose, one of the company's co-founders, who is leaving "to pursue other interests." Ambient's products include a $125 umbrella that lights up when rain is in the forecast, as well as displays that can show weather forecasts or sports scores. The company was launched in 2001 to help commercialize technology developed at MIT's Media Lab, and the institution's Nicholas Negroponte is on Ambient's board of directors. That was the same year, coincidentally, that Yankowski resigned at Palm, after the handheld maker had a brutal year, with huge losses spurred by a massive inventory glut. In 2004, he was named to lead Majesco, a video game publisher. It would be wonderful if the gold-threaded suit had actually been made in China and those strands were lead. He actually has a new suit with threads made of woven orphan tears. Very classy.